All the world’s no longer a stage. It’s just a very, very big game. Levi’s is leveraging our yen for unlocking badges, scanning codes, and checking in to raise awareness about water issues and bring clean drinking water to communities worldwide. With the launch of a new, interactive “WaterTank” game on Facebook, the denim giant is offering further opportunities for virtual one-upmanship through a series of challenges, the first of which is “liking” Levi’s on Facebook. By completing each task, you “unlock” increasing quantities of agua to support Water.org’s lifesaving projects across the globe. 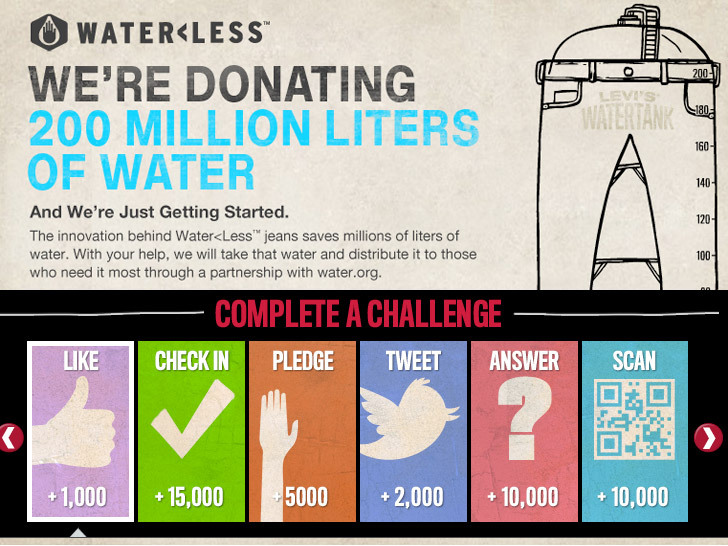 Through the initiative, Levi’s plans to donate $250,000 to Water.org, or the equivalent of 200 million liters of water. All the world's no longer a stage. It's just a very, very big game. Levi's is leveraging our yen for unlocking badges, scanning codes, and checking in to raise awareness about water issues and bring clean drinking water to communities worldwide. With the launch of a new, interactive "WaterTank" game on Facebook, the denim giant is offering further opportunities for virtual one-upmanship through a series of challenges, the first of which is "liking" Levi's on Facebook. By completing each task, you "unlock" increasing quantities of agua to support Water.org's lifesaving projects across the globe.